Orbital image from the The High Resolution Stereo Camera (HRSC) on board ESA's Mars Express. 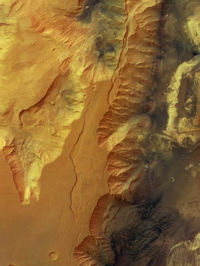 Candor Chasma is one of the largest canyons in the Valles Marineris canyon system. It is located at 6.6 S and 70.9° W (289.1 E) in the Coprates quadrangle. Candor Chasma is 810.61 km long. Mars Reconnaissance Orbiter discovered sulfates, hydrated sulfates, and iron oxides in Candor Chasma. Hence, water has been present in the past to form some of these minerals. Some researchers examined parts of Candor Chasm to find where a future rover might study sediments preserving traces of past life. 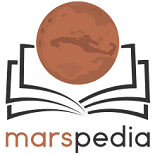 Coprates is the name of a classical albedo features on Mars. The name was approved by the International Astronomical Union (IAU) in 1973. 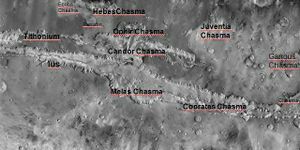 Chandor Chasma was made famous in the novel "Red Mars" by Kim Stanley Robinson as the location of the first future Mars base after the first manned mission in 2026. The idea of "Underhill", the first established settlement, originates from the Hillside settlement as designed by the Mars Foundation's co-founder, Bruce Mackenzie. A rendering of Candor Chasma using data from the The High Resolution Stereo Camera (HRSC) on board ESA's Mars Express. Candor Chasma location on Google Maps. Mars Express/HRSC imaging of Candor Chasma in December 2004. This page was last edited on 8 February 2019, at 17:01.